Secluded Colonial on 1.86 Acres! Luxury home on very private 1.86 acre lot! Sunny eat-in kitchen with breakfast bar, quality stainless appliances and tile floor. Modern dining room with crown molding, fireplaced family room and 1st floor office and 1/2 bath. Master suite with new wood floor, new tiled bath and dressing room with walk-in closet! Near the Cedar Pond Recreation Area and only 5 minutes from the MA Pike and Rt 84! Fantastic sunroom with hardwood floors, recessed lighting and wood ceiling. Family room with fireplace and crown molding, separate dining room and 1st floor office. 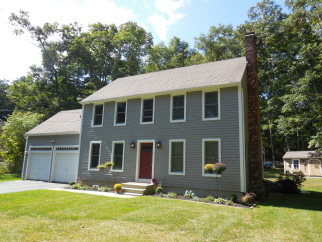 Upgraded vinyl shingle siding, storage shed, secluded fire pit area and lovely back stone wall. Beautiful private tree lined entry and very private 1.86 acre lot! Energy audit in 2014 and foam in basement and attic insulation added. Oversized 2 car garage and back concrete wraparound patio!